Ski Vermont’s Check In to Win program is returning the 2013-14 season and will be hosted by the ski and snowboard tracking application, Alpine Replay and co-sponsored by Verizon Wireless. Check In to Win rewards skiers and riders for exploring Vermont resorts and tracking vertical, speed, jumps and more. This season the first skier to visit all 19 alpine resorts will win a pair of Rossignol skis and the first snowboarder to visit 18 resorts will win a snowboard from Burton. Ski Vermont enjoyed a successful launch of the program during the 2012-13 season, winning the Governor’s SMART Biz Award for Marketing Excellence and a Travel + Leisure SMITTY award. It was the first statewide tourism program of its kind, promoting frequency and variety of visits to Vermont ski resorts via prize incentives. Partnering with Alpine Replay and Verizon Wireless for the 2013-14 season allows Ski Vermont to expand the already successful Check In to Win program and make it even easier. Skiers and riders need only download the free Alpine Replay application, get to the mountain and press “play” to track the days skiing and snowboarding stats. At the end of the day, users download stats and share with friends on social media. The more Vermont resorts explored equates to more chances to win bigger and better prizes. Participants can also earn Vermont specific medals and participate in competitions like the Vertical Challenge to win a ski and stay package in Vermont. 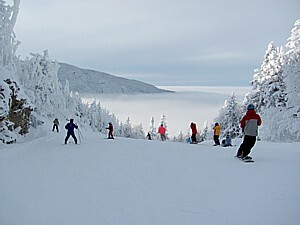 Using the Alpine Replay application at multiple resorts in Vermont will automatically enter participants for the chance to win prizes from Ski Vermont partners such as free lift tickets from Vermont resorts, swag from Burton Snowboards, Rossignol, anon, Darn Tough and Kombi, and treats from Green Mountain Coffee and Cabot Cheese.